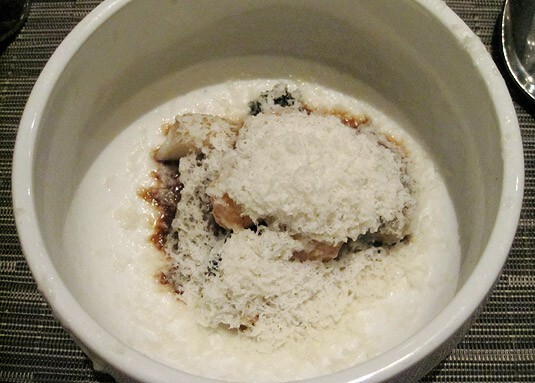 Last on our list of New York City restaurant visits was Wylie Dufresne’s WD-50. Located in Lower East Side, I wouldn’t say the neighborhood was the most enjoyable to walk through on a Friday night, but the unpretentious location hints at the chef’s character. 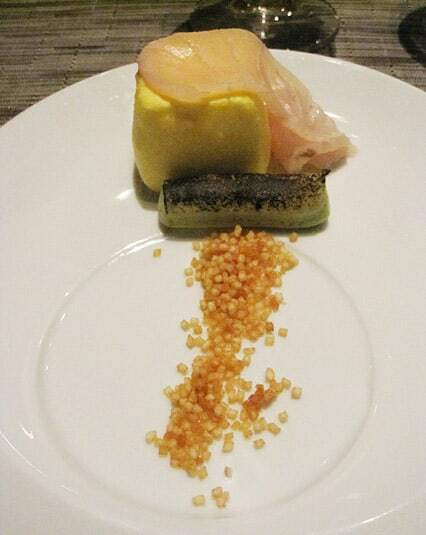 Dufresne is a leader in the molecular gastronomy movement, and he has won numerous prizes and much recognition over the years. He’s frequently been on Top Chef, either as a contestant or a judge, and he is highly regarded by his peers. Even so, he still has only one restaurant, he’s never published a book and he seems resolutely to want to keep a low profile. His public persona is borderline mysterious, and that intrigued me a lot. After visiting three of New York’s top restaurants without any of the celebrity chefs in sight, I was close to concluding that once a chef becomes a celebrity, he’s no longer in the kitchen. I wondered how a chef can maintain the level of quality his restaurant delivers when he’s not there. How can the restaurant keep the chef’s signature style if someone else prepares, serves and sometimes even conceives the food that is served? 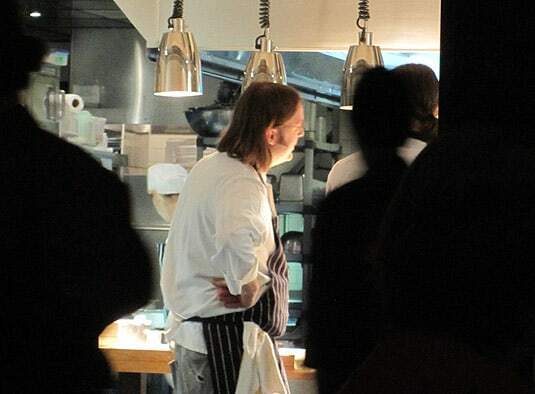 The fact that Wylie Dufresne, despite his success, still keeps just his one WD-50 restaurant was a positive for me, and it made me believe there was a greater chance that his restaurant still maintained his meticulous and creative cooking style. We arrived at WD-50 around 7PM, and it was still fairly quiet. The restaurant has a masculine decor, with straight lines, natural materials and low lighting. We were lucky enough to be given what is certainly one of the best tables in the restaurant, right by the modern fireside, the two of us facing the open kitchen at the back of the restaurant. We were promptly given menus and – my heart almost stopped – I spotted Dufresne right there, less than 15 meters away from us, in his kitchen! How strange is it to be so surprised to spot a chef in his restaurant? With my birthday coming up, E suggested that we make it my birthday dinner, as this was the absolute best time to choose the Tasting Menu with wine pairings. Turns out that spotting Dufresne at WD-50 isn’t so rare: three different servers assured me that the guy still loves to cook, and he’s still in the kitchen most nights of the week. I was charmed; almost star-struck. He wasn’t just at the pass either – his Chef de cuisine, Jon Bignelli, was – he was cooking and plating, back in the kitchen. I couldn’t help but think that this was the best way to end our week, and that the simple fact that the chef was there would probably make it our favorite meal in New York. Dufresne’s creative use of molecular techniques wowed us: we were often surprised, but never disoriented. 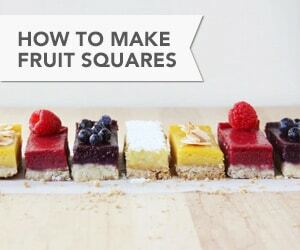 He seems to possess perfect knowledge of each and every technique, and he uses them to enhance dishes, not to steal the show. Not too many foams were in sight, although I have to say I’ve never eaten so much “dirt” in one single meal (which was OK to me since I had rarely tasted this before). Service was perfectly synchronized; casual but polite. Servers were also very knowledgeable: our lead server could answer all the questions we had about every single dish, and was able to describe at length how each plate was conceived and prepared. At the end of the night, seeing how enthusiastic I was about the fantastic meal we’d had, we were even offered the chance to visit the kitchen. Our server advised Dufresne that we were coming in, and then he led us right into the middle of the action. He showed us the different prep areas, as sous-chefs and line cooks were whizzing by us, showed us the molecular “pantry” with all its mysterious little white jars, and then presented us to Dufresne himself, who was kind enough to stop what he was doing for a minute to meet us, shake our hands and answer a couple of our questions. 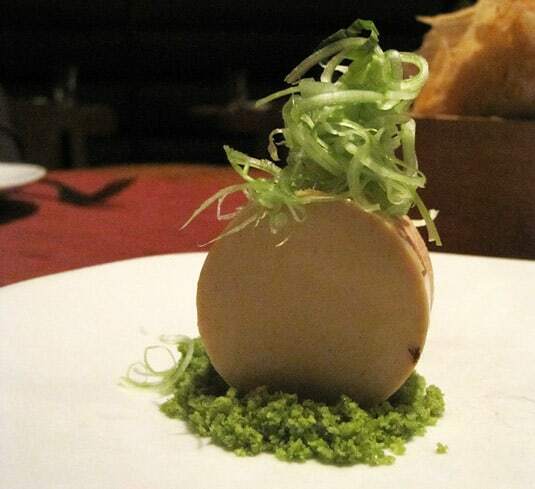 This was truly one of the best restaurant experiences we have ever had. I would strongly recommend WD-50 to anyone: tables around us seated everyone from friends to couples to families with young children. If you’re not so familiar with molecular gastronomy, this is the best way to learn what a difference it can make when used cleverly. Isn’t it great to enjoy a meal and be delighted, all the while knowing that what you’re eating is unique and that you would never be able to make it at home? I call it a perfect night. 1. 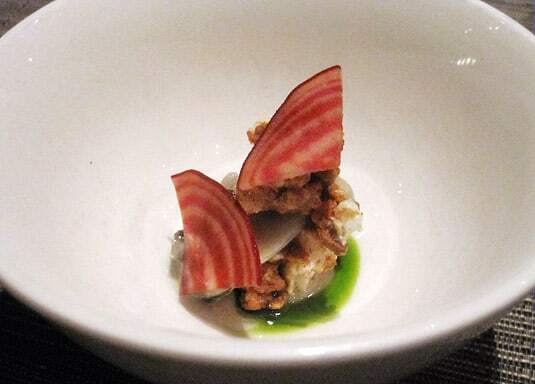 Sous-vide oyster, yuzu, chioggia beet, rice cake. Nice contrast of textures and a very flavorful bite to start the meal. 2. 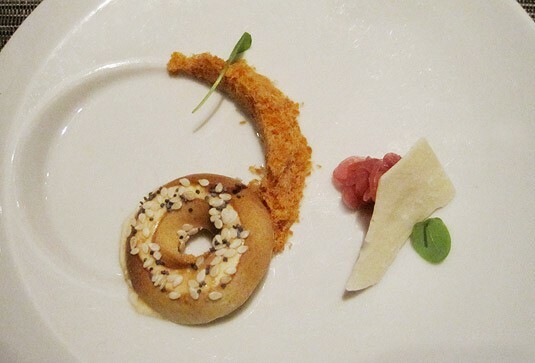 Cheekiest plate: called “Everything bagel”, the bagel was in fact cream cheese ice cream (painted and decorated to look like a mini-bagel), and it was served with smoked salmon threads. 3. 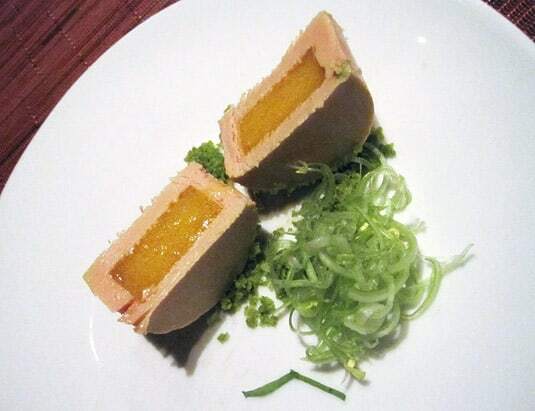 Richest bite: A block of foie gras hiding a luscious passionfruit coulis, served with Chinese celery. 4. 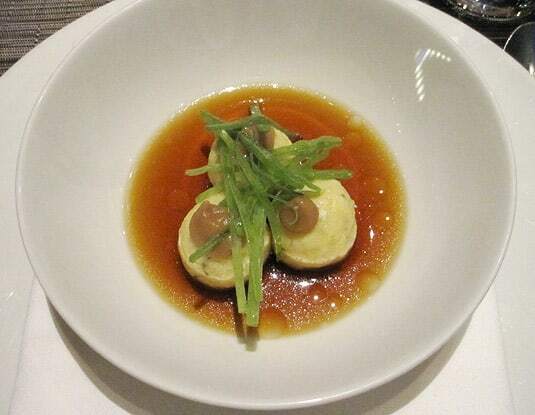 My favorite course: An airy scrambled egg ravioli, topped with a slice of kindai kampachi, a charred avocado/wasabi puree and wonderfully crisp, cute (and addictive) potato bites. 5. 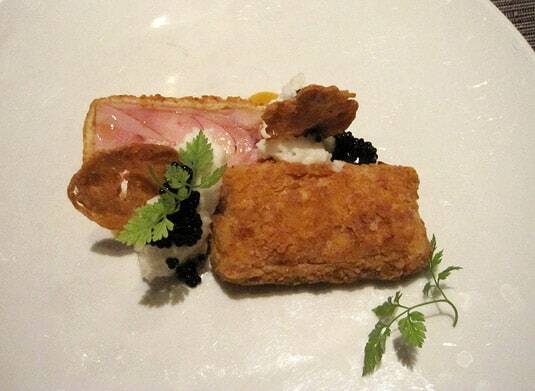 My least favorite course: Cold fried chicken with a buttermilk and ricotta puree, served with caviar and tabasco. The chicken tasted great, was well seasoned and very crisp, but this dish was the least surprising and innovative. 6. Most mysterious: No it’s not parmesan cheese, it’s finely shaved frozen bone marrow over scallops and parsnip seasoned with black sesame. 7. Best surprise: The menu said beef and bearnaise. You expect steak right? The dish was rather bearnaise gnocchi served in a beef broth. Lovely deep flavors. 8. Most delicate: Squab breast with cheese and pumpkin puree, mini-corn bread and pickled cranberries. 9. I forgot to photograph the first of Pastry Chef Alex Stupak desserts and it’s a pity because it was beautiful: a scoop of white beer ice cream with quince, caramel, and a zigzag caraway seeds cookie. 10. 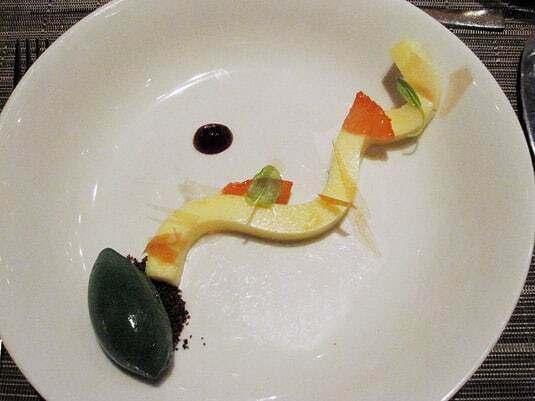 Zesty and velvelty grapefruit curd, with campari “glass”, hibiscus dirt and sorrel sorbet. 11. 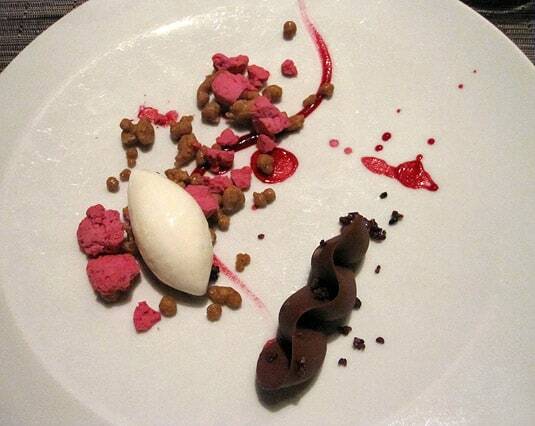 Most beautiful plate: Frozen beet bites, cocoa nibs, long pepper, ricotta ice creand and soft chocolate mousse. 12. 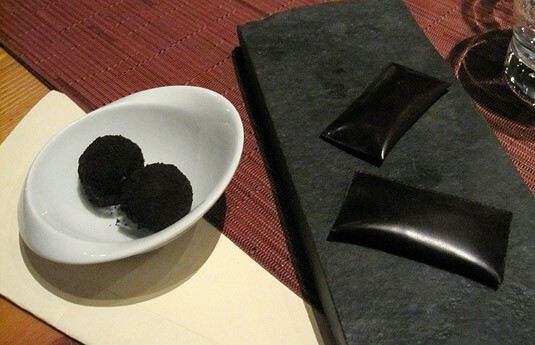 And to end the meal, les mignardises: no they’re not truffles but chocolate shortbread bites, and cocoa packets with a leathery outside and a crunchy inside. oh, i’m so delighted that you reviewed this restaurant. i could never eat here because of my food allergies/diet, so i have to live vicariously through others. but this is the one i’ve been most interested in since seeing Dufresne on Top Chef and seeing how he’s inspired some of my favorites on the show like Richard Blais! It must be a serious challenge to choose restaurants where you can go when you have food restrictions! Although I think being inspired by chefs’ creations and adapting them in your own kitchen is a lot of fun. Making Dufresne’s food at home would be quite a task but I’m curious to learn more about basic molecular-inspired techniques that can instantly upgrade basic dishes. I’ll try and get into that! Richard Blais is definitely one of my favorite Top Chefs as well, I hope he goes to the end this season! 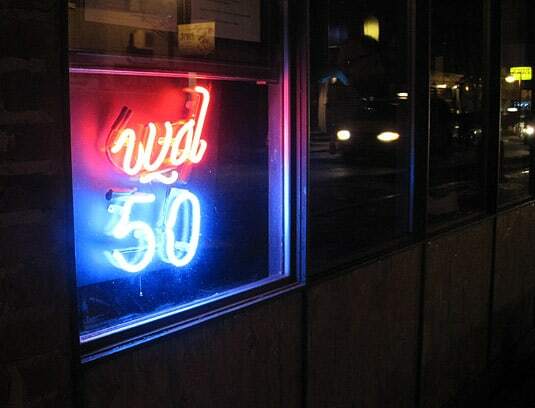 I went to WD-50 when I went to NYC two years ago, and it was a thoroughly enjoyable experience. Great food, gorgeous presentations and no pretension. There’s definitely nothing like it here in Toronto. Glad to hear it’s just as good as ever. 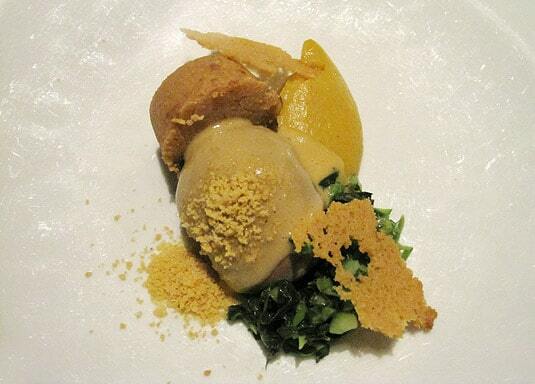 Hopefully I can make it back to NYC soon… I’d love to try those mignardises! Happy to know Dufresne’s cuisine is consistently good throughout the years! Isn’t the arrival of molecular restaurants a bit late in Toronto? Being the country’s food capital, I would’ve expected this trends to get there earlier. Or are there options that I don’t know about?